Plus Over 100 Other Chances To Win! Bethlehem, PA (May 2013) – To celebrate the return of MIKE AND IKE®, and the movie trailer “The Return of Mike and Ike,” fans are invited to enter the MIKE AND IKE® Movie Mania Sweepstakes. From May 15th until August 15th, all U.S. residents, 13 years of age and older, are welcome to enter at www.mikeandike.com. 25 Third Prize Winners: MIKE AND IKE® Candy Prize Pack which consists of a box of 24 1.8 oz. packs. 100 Second Prize Winners: Fandango Movie Tickets which are redeemable online with code. 25 First Prize Winners: 1 Year Netflix Gift Subscription that is redeemable online with code. Additionally, there will be approximately 150 Instant Win prizes randomly given out over the course of the 3-month contest. “The MIKE AND IKE® Movie Mania Promotion” will run from May 15, 2013 through August 15, 2013. The Grand Prize Drawing will take place on August 30, 2013. To enter, simply log onto www.mikeandike.com and fill out the form provided. The contest rules allow one entry per day, per participant, not counting bonus entries. Bonus entries can be gained toward the Grand Prize Drawing for every one friend that they refer via e-mail. Other ways to earn bonus entries include sharing the contest on Facebook or Twitter using the direct share links from the contest website. Following the initial entry, UPC codes are required for each subsequent entry. UPC codes can be found on all MIKE AND IKE® products as well as by request. For official rules please visit www.mikeandike.com. Mike and Ike are re-uniting for the love of their fans and their passion for MIKE and IKE® candy. The company says the business partners will still be involved with music and art, but are now refocused on what they are most passionate about -- MIKE AND IKE® candy. 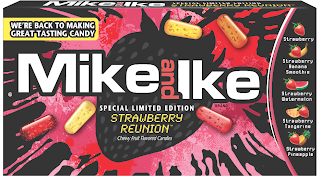 Mike and Ike have fused their individual interests in an effort to make their candy better than ever with new packaging designs inspired by Ike and a new flavor, Strawberry Reunion, inspired by Mike’s hip-hop song “Strawberry or Die” that he produced last year. 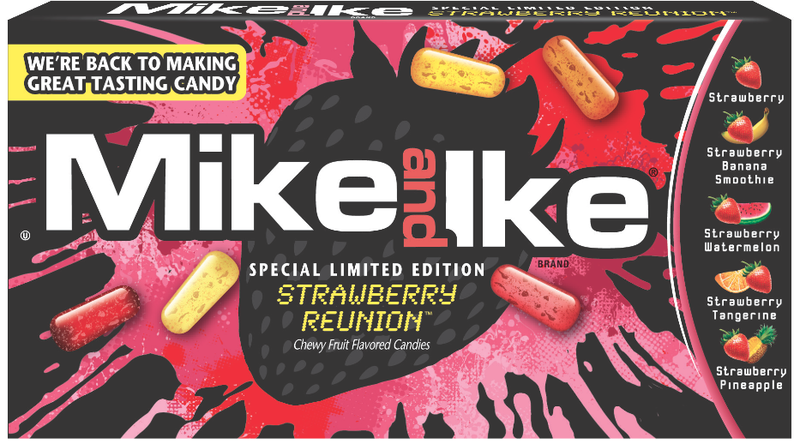 Strawberry Reunion and all other varieties of MIKE AND IKE® candies have amplified flavor with the addition of real fruit juices in each piece of candy! Just Born, Inc., makers of MIKE AND IKE®, PEEPS®, HOT TAMALES® and GOLDENBERG’S PEANUT CHEWS® candies, recently confirmed rumors that the legendary candy duo, Mike and Ike, have re-united. The candy duo cited irreconcilable creative differences a year ago, which caused them to stop collaborating on their famous fruit chewy candies. I was very fortunate to be able to try out a selection of the great new Mike and Ike's that have enhanced flavor due to the addition of real fruit juice! The Flavor that brought Mike and Ike back together! Inspired by Ike's artwork and Mike's music, our newest variety is all about strawberry. Strawberry blended flavors include: Strawberry, Strawberry Banana Smoothie, Strawberry Watermelon, Strawberry Tangerine and Strawberry Pineapple. Available for a limited time. Mike and Ike is a classic candy that is loved, and now that Mike and Ike are back together, back where they belong! We were so excited to be able to try some of the great tasting candy. We just loved the new flavor Strawberry Reunion, I especially loved that this candy is infused with real fruit juice. And you could really taste the difference. The flavor was sweet, and included Strawberry blended flavors include: Strawberry, Strawberry Banana Smoothie, Strawberry Watermelon, Strawberry Tangerine and Strawberry Pineapple. I adored the Strawberry Watermelon, it was such a unique flavor, my daughter picked out all of the strawberry banana smoothie, so I am taking it, that she really liked that flavor too. I was also able to try out a few other new to me flavors from Mike and Ike including, the Italian Ice flavors. Being from Philadelphia we are big fans of Water Ice (or Italian ice) it is a staple here in Philly, a great treat that is sold on just about every corner in the city. The Mike and Ike Italian Ice candy reminded me of the cold sweet treat that we love, especially the lemon one yum! This candy flavor Strawberry Reunion is available for a limited time, so make sure to pick up a box or two today! Make sure to enter the prizes include Netflix subscriptions, movie tickets, MIKE AND IKE® candy, and instant win prizes! Sounds like fun! The generous folks at Mike and Ike are giving one of Susan’s Disney Family readers a chance to win some candies from Mike and Ike. Would you like to win? Please check out the Just Born website, and take a look around then come back here and tell me your favorite candy from the site. There are also other ways to enter. Please enter below. All flavors have new packaging and enhanced flavor due to the addition of real fruit juice! Susan S. Disclosure: The reviews and or opinions on this blog are my own opinions . I received Mike and Ike to review. No monitory compensation was received. I was not required to write a positive review. Your experience may differ. The opinions I have expressed are my own I am disclosing this in accordance with the Federal Trade Commissions 16 CFR Part 255: Guides Concerning the Use of Endorsement and Testimonials in Advertising . I learned that they have new strawberry infused flavors. Learned there are flavors I didn't even know of! I learned that Last year candy legends Mike and Ike split up because they couldn't agree on new flavors, colors and packaging for MIKE AND IKE® candy. Thanks so much for the fantastic giveaway! I learned about the italian ice flavor. I think my husband and kids would love it. FYI, my husband's name is Michael (Mike), and one of my sons is Isaac (Ike). The difference of opinion regarding new flavors is what split them up for a bit. I learned that they have retro packaging. Learned that I really want some Mike and Ike's right now!!!! I learned that they have a blog post about the Great Gatsby! I learned that they are Kosher which I never knew and I eat all the time! I learned that Mike and Ike is made by the same company that makes Peeps. I learned they are kosher, did not know that!! I didn't know they had so many different flavors and combos. They also have jolly joes. they are made by just born...i did not know that till now! In 2009, Just Born opened its first retail store, PEEPS® & Company, in National Harbor, MD. Since then, we have opened 2 more stores. One in the Mall of America in Minneapolis, MN and the other in The Outlets at Sands Bethlehem in Bethlehem, PA.
Mike & Ikes are kosher? wow! I learned that Just Born is a family-owned candy manufacturer that has been in business since 1923. Mike and Ikes is a kosher product! The learned they split, I did not know they split. Are they really making a movie? New flavors and new packaging. They are. Kosher! That's surprising to me.